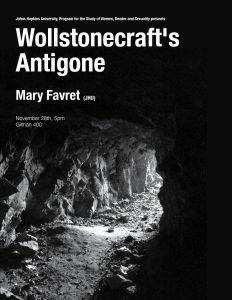 Please join us this week for the final WGS event of 2018, a talk by Hopkin’s own Mary Favret, ‘Wollstonecraft’s Antigone’. The talk will take place at 5pm in Gilman 400, on Wednesday, November 28. As usual, there will be refreshments available and the talk will be followed by a q&a. All are welcome. Mary Favret is Professor in the English Department at Johns Hopkins University. She is a specialist in the literatures of British romanticism, and is the author of Romantic Correspondence: Women, Politics, and the Fiction of Letters (Cambridge 1993) and War at a Distance: Romanticism and the Making of Modern Wartime (Princeton 2010).